Tim Wallace's wife died in a New Jersey boating accident several months ago, and the cops suspect Tim murdered her, though they have no real case against him. Now it's New Year's Eve, and his two best friends and business partners finally convince him to go out for the first time since Maggie's death. At their neighborhood pub just a few minutes before midnight, things in Tim Wallace's life go from bad to worse. "Can you keep a secret? A really big one?" a drunken stranger asks him. Before Tim can say anything or turn away, the man says, "You know Kinnelon, New Jersey? I murdered someone there. A girl...three months ago. I feel much better now. Now it's your problem." And he walks away. When the man turns out to have been telling the truth, Tim's life is put under the microscope by the cops, and this time they're not giving up. But neither is Tim. Eventually he realizes the only person who can figure out what's really going on is him - even if it kills him. ©2008 David Rosenfelt (P)2008 Listen & Live Audio, Inc. I was very disappointed with Rosenfelt's latest book, a stand-alone from his Andy Carpenter series. The characters seemed to exist only on paper - I never shook the feeling that they were simply figures created by the author to mouth words written by the author. It also seemed odd to me that Rosenfelt would follow his most recent Andy Carpenter novel ("Play Dead")with another story involving an exploded boat and a missing-and-presumed-dead love interest of the lead character. I felt as if Rosenfelt wrote this book so he could follow an alternative storyline he'd had to leave behind in "Play Dead." I too, was terribly disappointed and I wish the other reviews had been up when I bought this. I got about half way though this and simply couldn't get involved enough to even finish it, which is really rare for me. I have read all the Andy Carpenter books and based on those I rate Rosenfelt as one of my top 10, fun, interesting authors. I adore his other books, but this felt like a weak attempt to emulate Harlan Coben (excellent books, though they can be somewhat dark & disturbing). I really hate to say it, but skip this one. Rosenfelt's previous work had set my expectations high, and it was an exercise in perseverance to continue listening. The author was stingy with clues, so there was little opportunity for speculating solutions on the reader's part. When the denoument finally came it was a fair resolution, and interesting for the last part of the book. Not a bad listen overall, but lacking the entertainment value of the author's previous titles. This book was so boring I could not get past the first two hours. I listen to a wide varity of topics and this was in my favorite group, mystery and suspense. I could not finish it. I had no sympathy for the main character and did not care about getting to the end. Yes, it starts a little slow, and yes, if you've read the Andy Carpenter series it's a whole different ball game, BUT finish it and you'll enjoy it. I started it once and left it about 50 minutes; however, having just finished the Carpenter series, I expected more of the same. Ultimately, it has a good, original story line, and a bad guy you can't pick out until the end. Not as good as the Andy Carpenter series. The climax of the story was a let down. Predictable. Once you figure out the plodding premise...you realize its a bit retarded. There are no likable charchters; they vary from super whiney(the protagonist) to stupid. Even the scary monster guy is pitiful. This was one sorry attempt. Maybe it can become one of the Sue Grafton books - "P is 4 Plodding and Predicable"...Did I already mention Pitiful? Three stars for developing the Andy Carpenter Series and zero stars for this PileO'Poop. loved the plot,and the fast moving story line. Avid David Rosenfeld fan. Have read every one of his books! Ditto other reviews, it just wasn't as engaging or entertaining as most of Rosenfelt's books, of which I am a HUGE fan. I love the Andy Carpenter books and Grover Gardner's narrations, but this book doesn't leave you missing them. Great narration, different from Grover's interpretations, but just as good. Whenever I listen to it, I think "this one is my favorite." 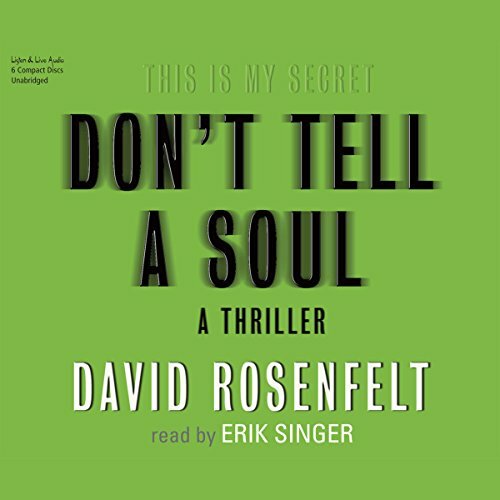 Mr. Rosenfelt's books don't set out to terrify you, but they have that thriller quality. Humor never lets you take things too seriously, but that's a plus in my book. I've enjoyed Rosenfelt's Andy Carpenter series and perhaps I was looking for this book--which isn't part of that series--to have the same humor and wonderful "North Jersey" narration style that have made Rosenfelt one of my favorites. Unfortunately, this book lacked the humor and seemed to take itself a bit too seriously. About 2/3 of the way through, I gave up and fast forwarded to the end. I strongly recommend Rosenfelt's other books, however, narrated by Grover Gardener.